A vegetarian dinner shouldn’t be any scarier than an occasional meal in a seafood restaurant or ethnic eatery. Treat it as a gastronomic break in your routine and an opportunity to discover new tastes. It could also be the outing you seek if you need to detox after the holidays, or if you have resolved to get a grip on your nutrition. 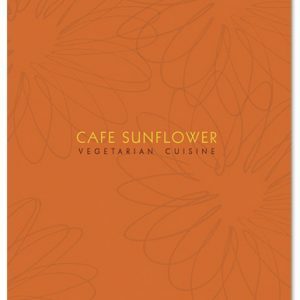 True vegetarians and vegans (people who eat no eggs or dairy products) are especially grateful for the culinary ambition and upscale decor of both Cafes Sunflower, the original location in Sandy Springs and the newer restaurant in Buckhead. Until the Suns and their Buckhead partner, Amy Head, entered the scene, the options for a special meatless meal were limited. The concept is the same in both locations:contemporary vegetarian cuisine with an international flair, no alcohol (no brown bagging, either) and a busy, craftsy decor. But there are substantial differences between the more casual original restaurant, which seems to have been decorated by a Martha Stewart type with an account at Williams-Sonoma and interest in handblown glass, and the recently opened Buckhead spot, which feels more avant-garde and more contrived, as if the decor had been handed over to an East Hampton craftsperson. The two cafes have a few dishes in common (including their excellent moo shu vegetables and their signature soy burgers on sunflower rolls), but 80 percent of the menu varies from one location to the next. “We didn’t want to be in the chain business,” says Edward Sun. In Sandy Springs the dishes are definitely homier, and the presentations aren’t as elaborate. There are some good preparations, such as the Tunisian vegetable stew with couscous; a pleasantly rustic fettuccine with wild mushrooms, sun-dried tomatoes and sage oil; and an Italian polenta with grilled vegetables. An excellent salad, with a choice of awful dressings, is included with dinner in Sandy Springs. The appetizers, chilled sesame noodles, stuffed mushrooms and fried spring rolls among them, are pleasant enough. Barbecued mashed potatoes (mashed potatoes topped with barbeque sauce) and a grainy tofu pie topped with fresh berry compote give vegetarian cuisine a bad name. We don’t feel deprived of animal protein at Cafe Sunflower, but we wish that more dishes would be a celebration of one dominant ingredient. The Bombay curry (potatoes, chickpeas, carrots, celery, onions, zucchini, and yellow squash, Indian spices) turns into a shopping list. Ditto the risotto-and-ratatouille entree, which includes 12 different vegetables (some of them stacked as a tower), plus saffron, capers and fresh mints, and it doesn’t taste on bit like a risotto. The Asian dishes have a clearer focus. One suspects that the owners’ Asian background is responsible for such choices as pan-grilled dumplings with fresh spinach, tofu and glass noodles; northern Chinese-style moo shu pancakes with marinated tofu and delicious vegetables; crisp wild rice and roasted corn pancakes with a awful but easily ignored wasabi-orange dipping slime. One could limit oneself to the simpler dishes such as a perfect Santa Margherita soup (navy beans, greens and tomatoes) followed by a comforting rice-and-grilled-vegetables burrito for an economical meal at Cafe Sunflower. But if one splurges on gourmet experimentation, from speckled bean dip (stiff as spackle) to spicy Thai salad (tart and snappy with raw, baby bok choy) and a real entree followed by a decent chocolate cake, the cost matches that of a chic, mainstream restaurant. The Buckhead Cafe Sunflower, bland on the outside, ambitiously decorated on the inside (modern stained glass, picket-fence art, dried flowers, faux walls), has the potential to be a showcase vegetarian restaurant. A greater commitment to locally raised organic produce and a step away from complication, towards elegant simplicity, would seal its gourmet fate.